Planet Earth | ...in case you were wondering. I’m a pretty big geek when it comes to natures shows, and since we got rid of our cable, we don’t have the Discovery Channel, or Animal Planet. One thing that I have been wanting to check out for a while now, but haven’t been able to is Discovery Channel’s Planet Earth. I have heard it’s amazing, I have watched a bunch of clips online, but have never actually seen any of the show. One of the gifts that I got for Christmas that I am pretty excited about is the entire series on DVD. Ever since I was a kid I can remember being fascinated by watching animals do what they do. And even now if there is some nature show on I am totally captivated. Remember Ranger Rick? I loved it. And from what I can tell our kids are pretty in to watching nature shows and reading about animals too. Most likely it’s because I am always convincing them that nature stuff is awesome, but I am pretty excited to eventually sit down with the boys and get our Planet Earth on. I’ve seen most of the episodes in the series. You’ll thoroughly enjoy them, nature enthusiast or not. I’m a meteorologist so just about anything concerning nature fascinates me. Especially when you look at how God made each animal a specific way to be able to live and survive in the different climates that they do. He doesn’t make mistakes. I’m also a space junkie and still find myself watching the shuttle launches and landings when I can. The cinematography is amazing. Also, I’m sure they’ll have the commentary on the DVDs, but take the time if their there to watch how they went about and what they went through to film this thing. It certainly takes a special person to do what these people do to just get one specific shot. Hope you all enjoy them. I’m dying to see that series. I’m ticked that I didn’t think to put that on my list. Dude ive seen it..own it…Amazing!! make sure and watch how they get all the crazy shots.. and the music goes along perfectly everything is beautiful.. Great gift. You are going to love this series! My nieces and I have watched the entire thing several times. They are awesome! Now I wishing I had gotten for my in-laws! Also, I loved Ranger Rick… smartest raccoon ever! Watched em all. It is amazing. Best to watch it in hd, but the quality definitely shows through on regular tv. Best tv series of 2007, not even close. I haven’t seen any of them, but they came highly recommended from my brother. I also have a love for animals and nature which led me to get a degree in wildlife biology. A cool degree, but hard to find a job in. My kids love it as well, definitely a parental influence! I do hope you enjoy it Brody, I think you will. Dad and I loved it as well as Noah. We were glad to get you something you really wanted. 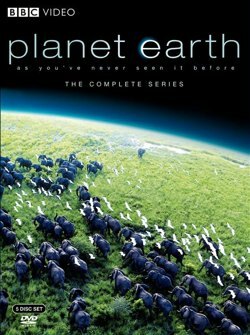 Planet Earth was awesome, i have the dvd set! In all honesty the very first episode is one of the most amazing impacting shows i have ever watched. We were blown away by the filming. my wife and i watched the whole thing in about 4 days…we loved it…even though it makes me sad to see animals eat each other. nevertheless, i think you will love it. we did. did you get the british version with the male narrator or did you get the american version with sigorney weaver? Wish you lived closer, so I could borrow it when you’re done.